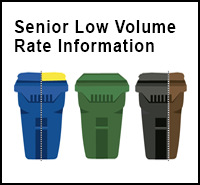 New Residential Curbside Collection Program began on December 1, 2017. *No charge for the Blue Recyclables Split Cart, the Green Yard Trimmings Cart and the Kitchen Pail. For cart sizes and rates click here. Your Blue Recyclables Split Cart has two labeled compartments: one side for paper/fibers, the other side for recyclable containers. WHAT GOES IN THE PAPER/FIBERS COMPARTMENT? WHAT GOES IN THE RECYCLABLE CONTAINERS COMPARTMENT? No Single Plastic Bags (please contain multiple bags in one bag, tie shut and place in the garbage). No Film Plastic, No Styrofoam, No Pressurized Tanks. Your Green Yard Trimmings Cart is for yard trimmings and clean wood only. 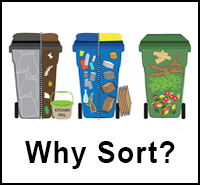 Food scraps and food-soiled paper belong in the special compartment of your Garbage/Food Scraps split cart. WHAT GOES IN THE GREEN YARD TRIMMINGS CART? Your Gray Garbage/Food Scraps Split Cart keeps food scraps out of the landfill. WHAT GOES IN THE GARBAGE COMPARTMENT? WHAT GOES IN THE FOOD SCRAPS & FOOD-SOILED PAPER COMPARTMENT? You can use any type of plastic bag to line the Food Scraps compartment of your Gray Garbage/Food Scraps Split cart and your Handy Kitchen Pail for use inside your home! coffee grounds & tea leaves. 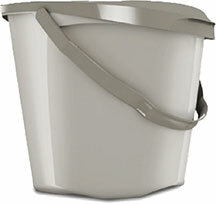 The Handy Kitchen Pail. – Use it to store your food scraps until you empty it into the food scraps side of your Gray Garbage/Food Scraps Split Cart. Can be stored under the sink or on the kitchen counter. Line with newspaper, kraft bags, paper towels or plastic bags. Rinse with warm soapy water when needed. For the Handy Kitchen Pail instructional video, click here. Gray Garbage/Food Scraps Split Carts keep food scraps out of the landfill! 40% of food in America is wasted. 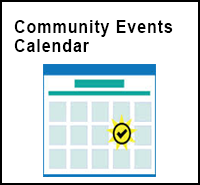 The City of Milpitas joins the cities of San José, Stanford, Sunnyvale and Santa Clara to sort food scraps. Over time, keeping food scraps out of the landfill/compost will help reduce environmental impacts-such as greenhouse gas emissions and odor. Battery Collection: Place household batteries inside a clear plastic zipper-lock style bag (no car batteries allowed). Please tape the terminals on lithium and 9-volt batteries. Place the bag on top of (not inside) your Blue Recyclables Split Cart for collection. Used Motor Oil and Filters: Contain used oil in a sealed 1-gallon, screw-top container* and filters in a sealed zipper-lock style bag*. Place next to (not inside) your blue recyclables split cart for collection. For more information about the used oil program click here. Used Cooking Oil: Contain used cooking oil in a sealed 1-gallon, screw-top container*. 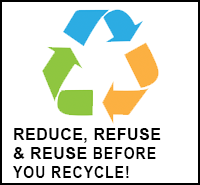 Place next to (not inside) your blue recyclables split cart for collection. For more information about the used oil program click here. *Free screw-top containers/bags provided by Milpitas Sanitation, contact us to order. Click here to download a printable PDF of this information.